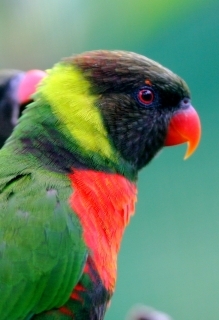 In recent decades the Mitchell's Lorikeet (Trichoglossus forsteni mitchellii) has suffered a steep decline in population due to the wild bird trade. Progress and outcomes: In April 2008, the Friends of the National Park Foundation (FNPF) team released three Mitchell's Lorikeets on Nusa Penida, with support from WPT. Later aid was provided for tracking the birds’ post-release activities. Surveys conducted on the island of Lombok in 2012, an area formerly known to contain birds, yielded no results, and it is feared that the birds may have been extirpated. Efforts are currently underway to develop a captive breeding and release program to include birds found in Indonesia as well as internationally. Releasing birds to re-establish the species in suitable habitat areas. Where found: Nusa Penida and Lombok, formerly found on Bali. History: Mitchell’s Lorikeet was historically found only on the islands of Lombok and Bali in Indonesia. Recently it has disappeared from the island of Bali, due to capture for the international bird trade. Trade has left populations on Lombok at a very low level, possibly with only tens to hundreds of individuals left. The birds on Lombok are currently unprotected and continue to be trapped, occasionally showing up in bird markets, particularly in Bali. Ecology: Mitchell’s Lorikeet is found on the islands of Bali and Lombok in mostly cultivated areas that have been nearly completely denuded of natural vegetation. They feed mainly on nectar but will also take figs and insects. They are generally found in mixed flocks with other parrots, in small noisy groups. These lorikeets are nomadic, as they are dependent on flowering trees. They will also roost and nest on the ground on some of the predator-free islands. Acrobatic displays in the air are frequent.